Amendments - Orders – Issued. 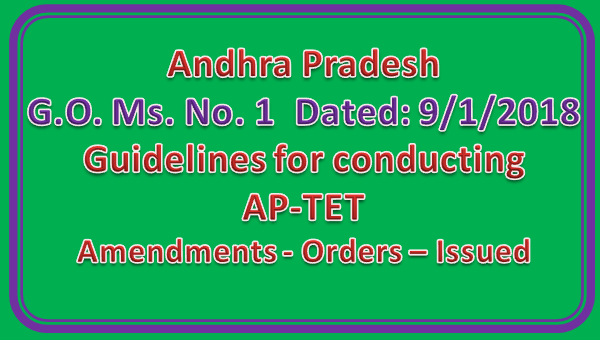 In the Government Order 1st read above, guidelines for conducting Andhra Pradesh State Teacher Eligibility Test (AP-TET) under the Right of Children to Free and Compulsory Education Act (RTE), 2009 were issued for conducting Teachers Eligibility Test. 2. In the circumstances stated by the Commissioner of School Education, AP, in the letter 2nd read above, and after careful examination of the matter, Government hereby issue the following amendments to the aforesaid guidelines issued in G.O. Ms. No. 91, School Education (Exams) Department, Dated 11/12/2017. the word “Odiya,” shall be inserted after the word “Tamil,”. Director & Convener, TET, Office of the Commissioner of School Education”. 3. These orders shall come into force with effect from the date of issue of G.O. Ms.
No. 91, School Education (Exams) Department, dt: 11.12.2017.